If you see this in a reduced bin at Pier 1, leave it there. No really. If you see this in a reduced bin, it's been reduced for a very good reason. LEAVE IT THERE. Paul, are the price tags still hanging from the inspirations or are those other thoughts that just might make one's day? I am still trying to eliminate per your earlier de-cluttering instructions so I am in no position to add more from the Pier One discount bins. Thanks for the words to strengthen my willpower against such decorating evils. They are the price and info tags Pier One puts on their crap to make it look more classy and legitimate. Ugh. 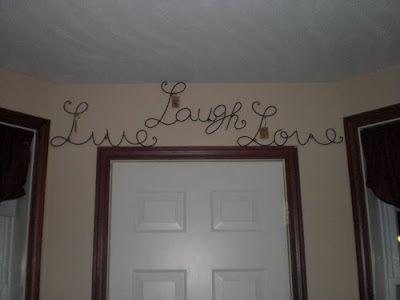 Do people really need these kinds of eyesores to remind them to live more, laugh more and love more? Isn't it better to actually live those things? Thank you. 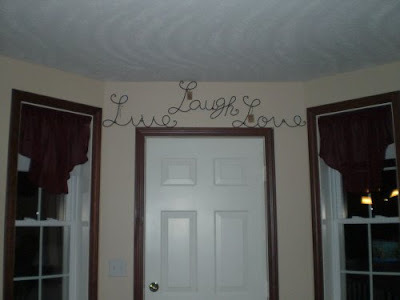 Besides these being particularly ugly, I really dislike words on the wall in general. I feel like they're always telling you what to do. Ugh. The whole idea just bothers me. It's that I hate words on a wall, it's more the cheese factor that rubs me the wrong way. So if the words fail to inspire, perhaps you need to keep the tags on to return them ... and get new words! These would never work for me as I need words I can use. Mine don't sit around hanging on a wall or collect dust.